The "Black-eyed chincherinchee" of which the flower lasts for weeks, even as a cut flower. - Can be planted in pots or containers or in the ground. 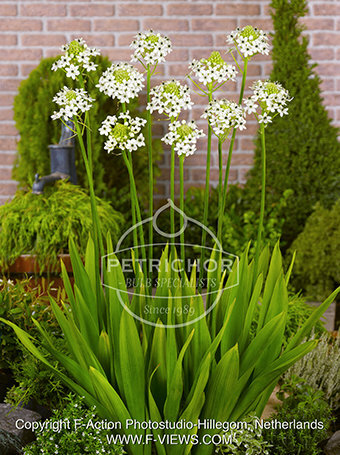 - Plant 2-3 times the depth of the bulb, in well drained soil and 15cm/6” apart. - When leaves die back and turn yellow, the bulbs need lifting and storing in a warm area. They will not survive the Winter outdoors. - If in pots or containers take these indoors for the Winter also, into a warm shed or greenhouse for example. - Be sure to renew the compost the following season.